The FTB Lite 2 mod pack is intended as a pack for players with computers that are not up to the demand of other packs. The pack is for people with less RAM and older systems. It will give you a full tech tree while being playable on 1GB of RAM. Like FTB Lite 2? Play the GigaTech mod pack. Construct factories, work magic, go to space. So much to do along with classic mods like Industrial Craft 3, Buildcraft 3, Thaumcraft and much more! Done! You can now player singleplayer FTB Lite 2 or multiplayer FTB Lite 2. That's it! 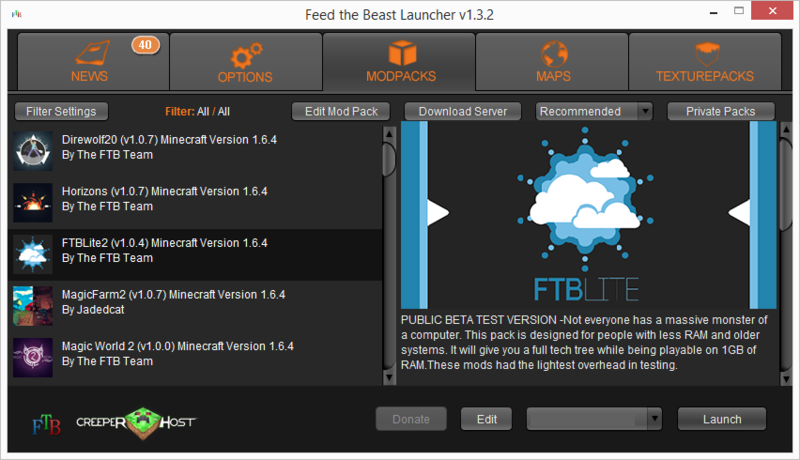 You have successfully installed FTB Lite 2 and can now launch it.